Like an illuminated book of hours, Record of Days transcribes the outer passage of time as an account of days, building simultaneously on a parallel contemplation of faith, and inner grace which moves our focus beyond time. In this way Sharon Marcus presents each changing season as a season of the heart. The four sections in this collection, evoking the movements of a symphony, are immersed in the four season as she passes through them. The poet uses different verse forms to study the inner structure of faith, to praise the Uncreated within the created. 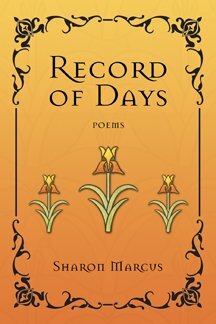 Whether she chooses prose poems, unrhymed sonnets, blank verse or other lyrical forms, Sharon Marcus pours her silent, unspoken prayer into a contemplation of light with her thoughts, with the words she has written down.